Shhhh... can you hear that? We're having a weekend-long rain storm in Vancouver. Know how I know? Well, from the weather channel, but also because I, a born and bred Vancouverite, actually noticed it was raining for once. It might be because I'm to rain what Bane is to darkness, but I find a downpour cozy and secure. I love that gentle plinking against the window. Rainy days expect less from you. They let you slow down, catch up on emails. They let you brood, or cuddle. They don't impose themselves on you like sunny days. 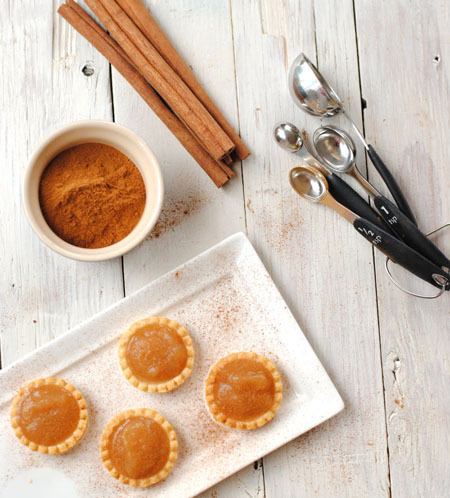 And these mini apple pies are perfect for days like today. But I can't take credit for them - the idea came from the boy. Because who else other than a 6 year old can think up something so simple, perfect, and comforting? With just two ingredients you'll have a dessert that tastes like you put in a ton of effort. (But that can wait for a sunny day). 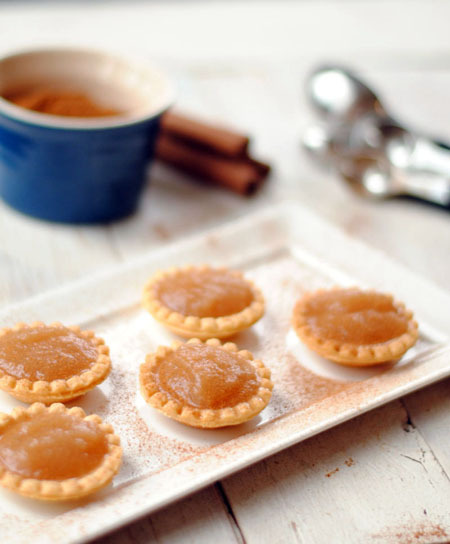 Arrange tart shells on a platter, and spoon in the applesauce. Gently sprinkle with cinnamon, or add a dollop of whipped cream for garnish.